Subject: Sicario: Day of the Soldado releases its first trailer. Theory: W. (2008) is underrated. This Friday marks the third time that Josh Brolin has popped up in a franchise sequel in Summer 2018. Following The Avengers: Infinity War and Deadpool 2, he returns to the one franchise that seems less likely to produce a sequel, Sicario: Day of the Soldado. It's a film based on the acclaimed, Oscar-nominated film by director Denis Villeneuve. It's gotten a bit of mixed reviews so far, but it serves as a chance to remember something important. It's something that 2018 has done better than almost any other year, even when he's been in better and more accomplished movies: Josh Brolin is one of the most underappreciated actors currently working. While one could argue that he's done better than these three movies, I think it's telling that he's been a big highlight of these films. To look at his work as Thanos in Infinity War is to see an actor able to be masculine while also deeply closeted emotionally. Beyond 2018, he's had an incredible career going back decades. To look back at films like No Country for Old Men or Milk is to see an actor who brings charisma to dark dramas that have conflicted characters battling for control. Even to go into comedy with Inherent Vice and Hail Caesar! is to see an actor who can carry comedy. Even Men in Black III shows that he's able to turn a very thankless role (imitating Tommy Lee Jones, no less) into something fun and comic. To say the least, he's an actor who at times captures the best of a bygone generation, being able to be masculine while tragic and funny. To compare him to someone like Cary Grant is maybe a bit of a stretch, but he's still a pretty good descendant of the beloved actor. Which brings me to my point. There is one film that came out in the wake of his acclaim for No Country for Old Men that seemed like it was primed for more attention. It wasn't Milk, which would go on to get some Oscar love that year. 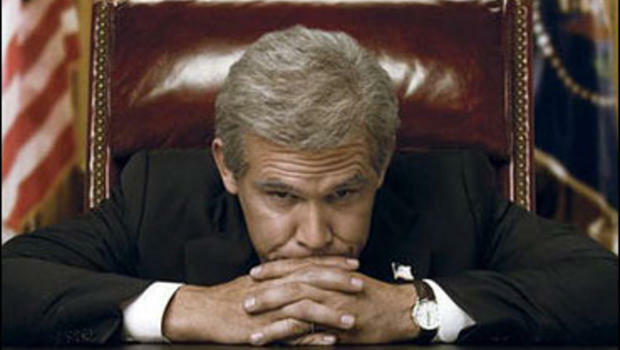 It was director Oliver Stone's film W., which took a look at President George W. Bush's first term as a president. It was sold as a farce, including posters that were labeled "A life misunderestimated." It played into the vision of a leader who was not good with words, who was a goofball and frat boy who lucked into a position that most people believed he didn't earn. To make the matter even more sweet, Bush was still in his waning days as president, which was one of Stone's boldest subjects to that point as a result. His previous president films, JFK and Nixon, had the benefit of time to dissect what an icon meant to the various generations. For W., its biggest issue was that Bush was still a figure whose notoriety was being made. This leads to a lot of questions regarding why Stone was eager to make this film, especially since it was disparagingly different compared to JFK and Nixon. However, I think that it perfects a possibly unintentional trilogy of films with tones that are different, but whose substance remains largely the same. True, Stone is a controversial figure, and JFK is notoriously riddled with inaccuracies, but there's no denying that as a film it captured the paranoia that came with John F. Kennedy's assassination. It was a procedural film not about facts, but the atmosphere of the decades that followed, tearing the country apart with an uncertainty that they couldn't handle. Nixon was at times more conventional but was essentially a Greek tragedy about Richard M. Nixon. It was the story of a man where power was never enough and he would succumb to its toxicity. W. may look different from both of these movies in part because it's shorter and more recent, but its status as a farce is integral to why it works. Stone has explored politics through a procedural, a Greek tragedy, and now something a bit sadder. W. has a lot more comedic touches and thus maybe seems a bit less significant. However, it's key to understanding Bush through Stone's vision. Bush isn't a mastermind like Nixon, nor is he the tragedy of Nixon. He is a child of a powerful politician whose life went from spoiled alcoholic to born again Christian. Along the way, there is an ongoing theme of Bush trying to please his father, George H.W. Bush. It is a more personal drama that is intentionally a trainwreck because Bush's life was at times that way. Even as the film contemplates his first term as president, looking at his decision to start a notorious war while negotiating with his staff, he is seen doing subtle things that are clearly comical. Bush claims that he wants to get healthier, but is seen a scene later drinking a soda at dinner. Even if Stone doesn't make it entirely farcical, he sprinkles in such things as a goofy cover of "The Yellow Rose of Texas" to reflect the mentality of a character who seems out of place. The scene that best encapsulates what Stone was going for is found in the final moments of the film. Everyone in the audience knows what notoriety lies ahead for him. Still, there is a scene that calls back to his youth, when he owned a baseball team. He's out trying to catch a ball. The scene is shot like a 50's-style comedy where Brolin mugs to the camera. It isn't really funny, even though Stone composes the shot like it. It's the balance of expecting comedy but expecting tragedy. Bush doesn't know what he's about to catch, much like the baseball that is just off screen. He wants to please, but if he literally drops the ball he will be ridiculed for the rest of his life. It's in moments like this that Stone manages to convey the struggle of Bush as a character and caricature. He's very damaged, but the audience wants to laugh at him. It's frustrating when that doesn't happen, and it's brilliant at being an intentional disappointment, even as Bush pleases his father, which is the bigger achievement in the film. It's a tale of redemption, even though it's not one that the country likely agrees with. W. may have been just a victim of bad timing, or maybe the idea of making a movie where Bush isn't entirely derailed still seems controversial. The film doesn't disown the failures of the president, but paints a picture of a man who bumbles through life as a farce while trying to be taken seriously. It's one of the most ingenious tonal balances in Stone's career, and it probably rubs people the wrong way as a result. But still, it captures the struggle of a figure who was at the time at peak notoriety. It was impossible to see him as human anymore, which is what Brolin did so well. He played the character in a deadpan fashion that captured his internal struggle while capturing his insecurity that inevitably lead to many of his faults. If taken out of time, he seems like one of the strangest characters, possibly from a Peter Sellers-esque comedy of the 70's (like Being There). Instead, he's real. Much like Danny Boyle's Steve Jobs, however, there's enough problematic elements around the film that inevitably will keep a good portion of the population from ever seeing it. Either that, or the idea of seeing yet another Bush parody in 2008 was just insufferable - as Will Ferrell cornered the market perfectly. There's a lot that is true about the film, notably that it's not JFK and Nixon-level great. There's no dramatic moment that elevates it to the famous "Magic bullet" court room scene. The film doesn't have the grandiose awe of Nixon either. It just has a president who seems a bit of a lesser. Then again, that's what drew Stone to the film most likely. It's because Bush was perceived as a bit of a dimwit that the film was able to be more appealing than say a Clinton or even Reagan film. Every president has a fascinating story to tell, but Bush had something greater as a narrative. He was a flawed man that in fiction would be cheered on. However, because he is so much of a lesser president in the eyes of people, his story can't help but feel the same way. Still, Stone captures an incredible balance of tone of a man trying to find significance in his life while failing to realize it sometimes. Brolin is an incredible actor with such a strong resume. I think that he has only continued to do incredible work in the decade since W., and has only proven just how charismatic and diverse his filmography is. Still, it's a testament to his capabilities that he managed to turn in a role of a notorious president with so much heart and earnestness, while also making him a tragic comic figure that was a caricature of what audiences expected of Bush, and an even more human character underneath his sometimes awful behavior. W. isn't a film that is going to change anyone's opinion on Bush, but it deserves to be better recognized as a film that pushes boundaries and tries to find something new and inventive in Stone's sometimes stale output. To be fair, Stone's most recent go at a biopic, Snowden, shows how things could go wrong at trying to be edgy and current. This isn't to say that Stone is perfect at scratching raw nerves, but sometimes like with W., he gets to the very core in interesting fashion. Labels: 2018, James Cromwell, Josh Brolin, Oliver Stone, Richard Dreyfuss, Thandie Newton, Theory Thursday, W.